Million people will not live to past a week. Congratulations, you better fate than 5 million people. Congratulations, you have more freedom than 1.5 billion people . You are richer than 70% of the world. You are among the world's top 10% of the rich. Because most people can but will not do so. Congratulations , because you are with the ability to heal people's hearts. And there are 1.5 billion people illiterate. How lucky you are now! ? 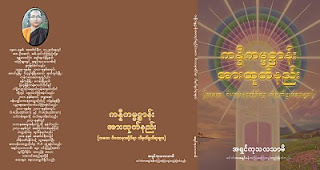 ေကာင္းျမတ္ျခင္း၊ ေပ်ာ္ရႊင္ျခင္းမ်ား သင္နဲ႔အတူ ထာ၀ရ တည္ရွိပါေစ…..